Some historians believe that beer saved the medieval world when clean drinking water was hard to come by. Today’s microbrews have had an equally positive effect on Bend’s economy by creating jobs and encouraging tourism. 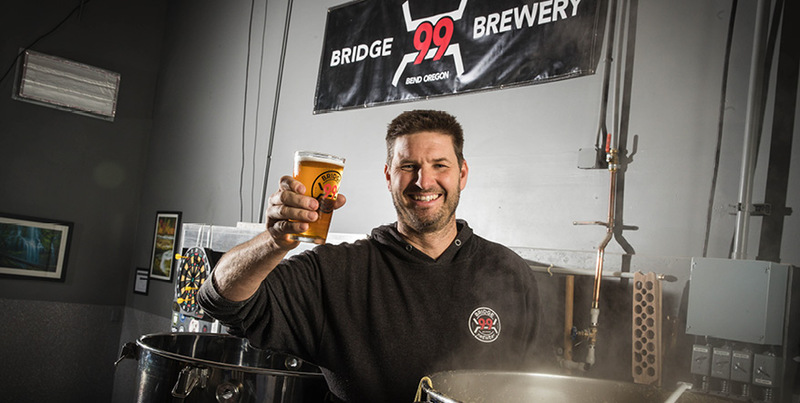 Trever Hawman, owner and partner of Bridge 99 Brewery, has been part of that growth. Trever and his wife moved from Walla Walla a while back for her career. The couple loved Central Oregon, and Trever quickly found work as a custom home subcontractor – something he’d been doing for years. Life was pretty great. But it was about to get better, thanks to Trever’s fascination with beer and brewing. NWCU already knew me because I had my personal accounts there. So I just walked in and opened our business account. That’s when he and his longtime friend from the construction industry started Bridge 99 Brewery, sharing Trever’s sudsy microbrews with fans all over Central Oregon and beyond. Of course, it wasn’t that simple. They needed a good location, which they found at 63063 Layton Avenue on Bend’s north side. Once the brewery had a home, Trever and his partners got to know the local business community and persuaded Bend’s beer elite that their brew was worth trying and buying. It’s easy to see why Trever is a successful brew master. Everything about the industry and the job excite him, from new kegs to the possibility of expanding and growing. And while he and his wife enjoyed the Central Oregon lifestyle a lot more before the brewery’s success, he says the best part about the area is the people. At Northwest Community Credit Union, we applaud innovators, risk takers, and microbrewers. While Trever and the Bridge 99 Brewery crew are busy delivering fresh, friendly beers handcrafted by locals, we’ll be here to help them run their business with eBanking for their smartphone and a Northwest Community Visa® debit card to keep the beer flowing.